Are you still using AOL? Actually, there’s nothing wrong if you are. AOL remains a very prominent player on the Internet. AOL.com is the fourth most visited Web site, AOL mail is the third largest global email service, and AOL instant messenger ("AIM") continues to dominate instant messaging in the United States. The biggest downside to using AOL is that the company hasn’t always done the best job of keeping its Mac software current and working well. So how can you still use AOL without relying on its less-than-best software? One answer is that you can do almost everything through your browser. Via Safari you can go to AOL.com and access AOL’s content, mail, instant messaging, radio, and just about everything else the service provides. This is an especially convenient solution if you happen to use several computers, because everything is saved at AOL. 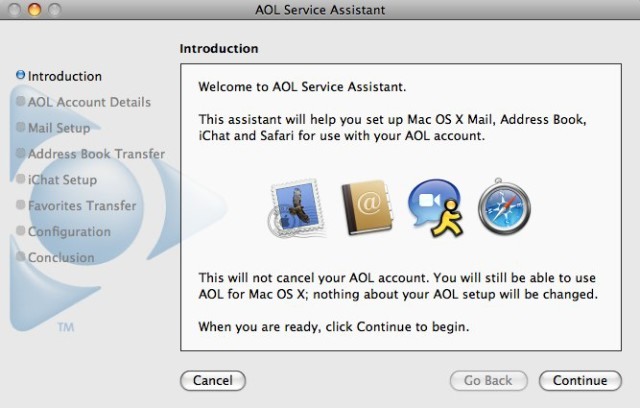 Another answer is to use AOL Service Assistant and migrate to Apple’s software. Years ago, when Mac sales started to grow, AOL realized it hadn’t done a good job of supporting Apple computers. AOL for Mac OS X was not keeping up with changes to Mac OS X and its replacement, AOL Desktop, was a long time coming. AOL also realized that Apple always kept its own software up to date, so it got the idea of making it possible to use AOL services via Apple’s software. The resulting product was a tool that made migration quick and easy: AOL Service Assistant. Mail: The AOL Service Assistant makes it easy to configure Mac OS X Mail to send and receive AOL mail. If you’ve used the existing AOL service for Mac OS X, you can also import your incoming and outgoing messages from your Personal Filing Cabinet into Mail. iChat: You can now easily set up iChat to work with your Screen Name. Address Book: Using the AOL Service Assistant, you can now easily import your AOL Address Book contacts into your Mac OS X Address Book without bringing in duplicate entries. Safari: AOL Service Assistant helps you import your AOL Favorite Places into a folder in the Safari Bookmarks Bar. Of course, using AOL via AOL.com or through Apple’s software isn’t for everyone. Change isn’t always easy or fun. For those who don't want to deal with the change, there is now another option. AOL Desktop, the new all-in-one software from AOL for Mac OS X, is now available for download at http://daol.aol.com/software/. To each his own! In summary, there’s nothing wrong with still using AOL. The company offers a huge variety of valuable Internet services. Just be aware that you have at least four ways to tap into those services and you should use the one that works best for you. Want to save $300 per year on AOL? The most common price plan for AOL is $25.90/month but several years ago AOL started to promote a free plan. “Free?” you ask! Yes, for AOL customers who have their own broadband connection (either DSL or cable) and who don’t care to receive free telephone support, the price can be changed to free. Do I lose anything else when I go to free? You lose nothing of consequence but you gain $300 per year. Just go to MyAccount.AOL.com for more information and to change your price plan.